Taipei, Aug. 21 (CNA) China's many actions to suppress Taiwan have implications for not only Taiwan but the world because they demonstrate Beijing's ambition to challenge and replace the existing international order, President Tsai Ing-wen (蔡英文) said Tuesday. "I would like to remind the international community that this is not just about Taiwan. 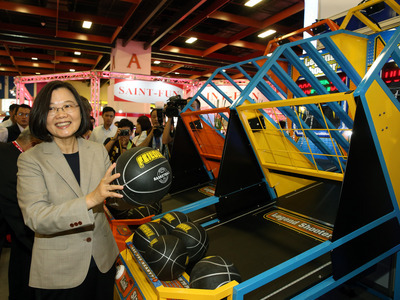 The severity of the situation has left no room to appease (China)," Tsai said. Tsai made her appeal at an impromptu press conference at 12:20 p.m. after her administration announced pre-emptively five hours earlier that it was terminating diplomatic ties with El Salvador as the Central American country prepared to switch recognition to China. Since Tsai took office in May 2016, Taiwan has lost five diplomatic allies -- Sao Tome and Principe, Panama, the Dominican Republic, Burkina Faso and now El Salvador -- that have been lured away by financial incentives from China. Tsai said her administration has been aware of the possible shift in recognition for a while and has tried to work with international friends to prevent El Salvador from becoming a diplomatic battlefield involving the two sides of the Taiwan Strait. "Regrettably, the Chinese government had no intention to step back but instead scaled up its pressure (on El Salvador), with the aim of breaking the resolve of Taiwan's people to go out into the world," the president said. China's behavior around the world, whether interfering in the internal affairs of other nations or disrupting the international economic order, has created high levels of disruption in the world, Tsai argued. "China nowadays is not just a threat to Taiwan," she said. Tsai said her administration will continue to cooperate with like-minded countries to confront China's international behavior, which she described as gradually spinning out of control.